An extract from a piece by Jonathan Jones in the Guardian titled Edinburgh Art Festival: the best of this year’s public commissions. Published 7 August 2013. Warmed by my beer, I descend into Chalmer’s Close, one of the old alleyways that branch like dark veins off the tourist artery of the High Street, to find a medieval chapel built in the 16th century, demolished in the 19th when Waverley Station claimed the land on which it was built, then partially reconstructed on this side of town. In this gothic hideaway, artist and musician Sarah Kenchington has created a scrapyard sound machine. Pipes cannibalised from old organs have been lashed on to a frame and painted with colour codes to help visitors identify their notes. A helper releases a giant lever and air is pressed into a bag of plastic sacking, and then on into the heart of the machine. Soon the room is full of whistles and honks, as if there’s a snoring Loch Ness monster in residence. Kenchington’s mechanism, perfectly tuned, creates a kind of musical utopia. In an ideal world, everyone might play together on some vast instrument that generates harmony without suppressing individuality – and here is that very thing. Anyone can work the levers or play the pipes. It takes at least two people; the more the messier. It’s a festival in itself. 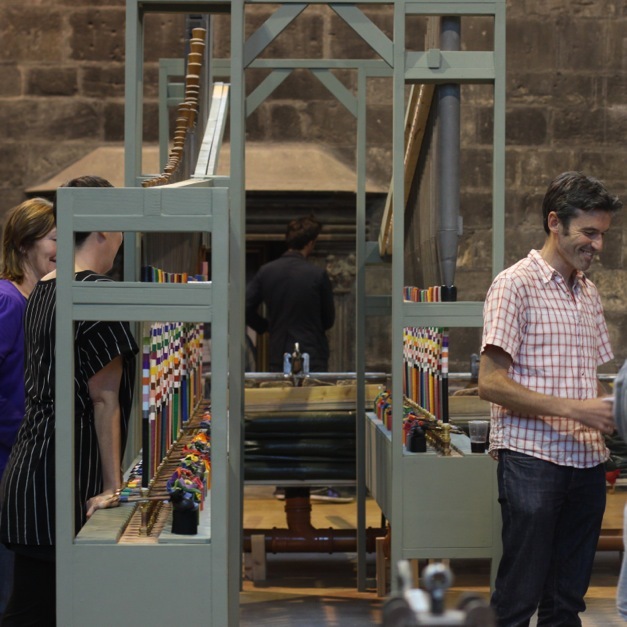 Sarah Kenchington’s Wind Pipes for Edinburgh were commissioned by the Edinburgh Art Festival. You can read more about the piece here. It will be touring from 2014 onwards, if you’re interested in hosting it please do get in touch.